As with every accessory which is mounted or attached to any sort of weapon, the first question you have to ask is: what will I be using this weapon/accessory for? What is the idea, the objective, behind my owning this weapon – be it an M16, Spyderco knives, or anything else? And, why do I need this particular accessory? In order to answer those questions, you need to consider things like the supposed range of engagement, the identity (human/ animal/vehicle) of the perpetrator, the terrain of the encounter. Practicality, aesthetics, and usability are also things to think about. All of these things are important. When it comes to picking optics, remember that no single scope can do it all. If you know, for a fact, that you plan on using this weapon defensively, it usually means that the engagement will occur within 100 yards. In that case, do you need to get a very advanced scope, with all kinds of advanced capabilities? Probably not. 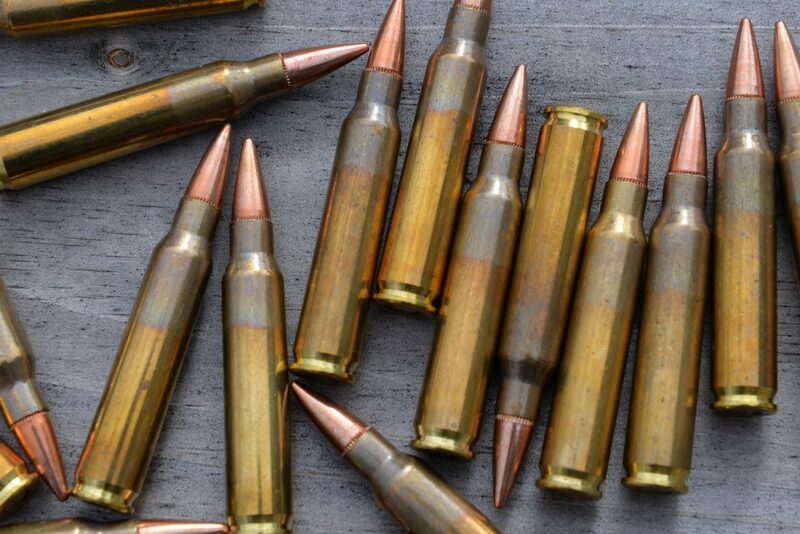 You could easily go with a variety of optics such as lasers, lights, and other kinds of visual enhancers that do not necessarily have a great magnifying effect, but that gets the job done at 50-100 yards. If, however, you feel you would like to have the option of making the shot count, from over 100 yards away, you should probably go with a regular scope (and I use that term loosely), without anything fancy on it or in it. A regular scope (1-2 power) is enough for those distances. It will probably be a good basis from which to launch defensive action, and it still gives you the option of firing at short ranges. Just because you have a scope mounted on top of your weapon, does not mean that the firearm becomes useless for close quarter battles (CQB). As far as ranges go, for the sake of this post: 0 – 50 or 100 yards will be considered short range. 100 – 300 will be mid-range. 300 and up will be considered long range. This is all somewhat subjective because people’s eyes work differently. Some people will be able to spot a lot more at short range than others, so they will see no need for a scope at those distances. Others will insist that it is an advantage that should not be passed up and that it is an integral part of preparedness and home defense. Both ideas are valid. Other considerations should be weight and cost. For instance, if you know you will be using this rifle at close ranges, and at situations where there is no real need for a very tough scope, you can do very well with a 1-4 power scope. That kind of scope can cost even less than $100. Other scopes, which are more heavy-duty oriented, can cost more than $1000. The differences are sometimes not worth the money, and it all comes back to that initial question of use. The M16 is very lightweight, and the last thing you want to do is take a light weapon and burden it (and yourself) with a heavy, oftentimes-unnecessary scope. Another issue to think about is complexity. The long-range scopes usually use a battery of some kind, and these batteries could potentially fail when you need them the most. Scopes can be triggered by mistake, and then left in the ON position for hours, draining the battery and making the optic aid useless. Some scopes are illuminated, and others are not. Some have additional dials, some do not. It is something to consider because the combination of weight, cost, and complexity could make you go in a whole other direction when in the market for an optic piece. Positioning and eye relief are also very important. Eye relief is essentially the range of distance between your eye and the scope’s eyepiece, which provides a clear and sharp image of the target. Ideally, you would want a scope that can give you a good view of your target, regardless of where you are positioned along the stock of the rifle. Some scopes have very short eye relief, and they require the shooter to pull back or lean forward across the stock. Obviously, this is not what we want. It wastes time and energy that would be better spent firing at the target. Some scopes have predefined eye relief distances, but most have some kind of a range, measured in inches. Other factors to consider include brightness and clarity of the glass. Good quality glass will cost money. Good glass is usually on scopes starting at the $1000 point. That is not to say that there are no cheaper scopes with good glass, it only means that, on average, you won’t find really good glass in those scopes. The high-quality glass offers different coatings, reduced glare, better light collection (which is crucial at night). The important thing that you need to constantly keep in your head is: what is my target? Again, this is THE question. What will I be using it for? And when? Day, night, dusk, dawn? In any situation, these optic aids are here to allow the shooter to do one thing – identify the target. That is it. They serve no other purpose, even if you happen to find another purpose! When it comes to sights, etc. – the more expensive gear is usually that much better. In the world of scopes and visual aids, the price increase is more often justified. You can immediately tell the difference between a good scope and a piece of junk. Of course, be realistic. You don’t necessarily need a $2600 scope on your $900 AR-15. The M16, and its cousins, usually fire 5.56mm cartridges. After a certain distance, the 5.56 bullet will lose its speed and begin to drop. So, if you plan on firing this M16 at mid-range targets, there is no reason to invest in a very powerful scope. No reason to purchase a scope that can outdo the very ammunition which you plan on firing. Sniper rifles, for instance, usually make use of larger calibers, precisely for this reason. They have long-range cartridges in their magazine, and they have the advanced scopes to boot. Gathering light is paramount. This means that the bigger your objective lens – the one facing the target – is, the easier it will be to acquire the target. This comes at a price, and that price is not just a dollar amount. I am talking about weight. Lenses can be heavy, and – once again – you will have to exercise some of your own judgment. Speaking of light-gathering, another factor which contributes to the gathering of light is the tube. A larger tube will let more light in, and give the shooter better adjustment capabilities. But a larger tube will mean more glass, and that means more weight. Are you noticing a pattern here? A scope with low magnification will most likely give you a wider field of view, and that can be very important. After all, acquiring the target is all well and good, but ideally, you also want to keep an eye on what’s going on in the field. This is true whether you are training, hunting, competing, or doing anything related to weapons. You want to be aware of your surroundings. High magnification gives you easier target acquisition at longer ranges, but then you compromise your immediate view. Also, there is – once again – the matter of weight, cost, and complexity. Remember: the M16 was designed to be a lightweight, close-encounter kind of rifle, not the kind that could shoot a flea off a dog’s back at 700 yards. Scopes are distinguished by their optic abilities, which are represented by a series of numbers such as 4-8X40. In this case, the 4-8 means that the image which the shooter sees in his eyepiece is shown at 4 times its actual size and that the scope can reach up to X8 magnification. It is known as a variable scope. 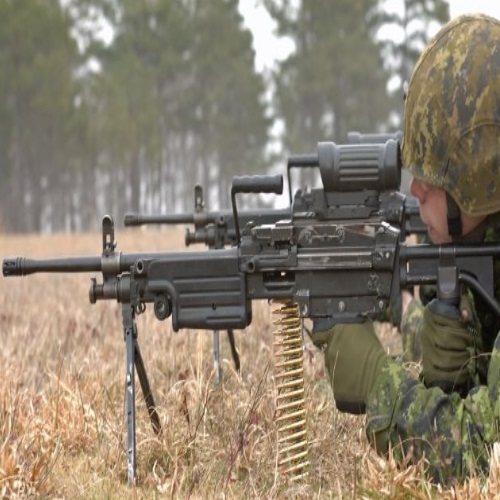 The 40 refers to the size of the objective lens – that is, the lens facing the target. The size is measured in millimeters, and the larger the objective lens, the more of the available light can be gathered. A small objective lens is lighter and easier to handle. A larger lens may have visual advantages, but usually weighs and costs significantly more. Large lenses are best used in poor lighting conditions, or for extremely long ranges. 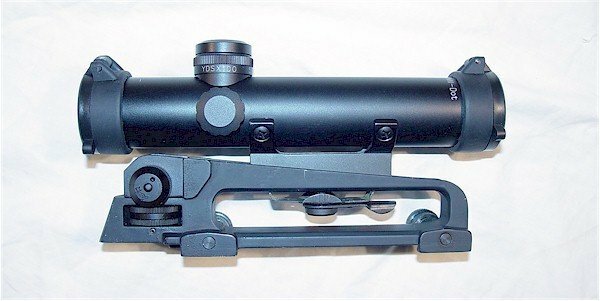 Another example of a scope is 6X32. It represents a fixed image zoom power of 6, with no ability to alter it. It is static but simple. Simplicity counts a lot, especially in emergency or combat situations. If you know what conditions you are heading into, a fixed focal scope may be all you will need. The 32, as before, is the size of the objective lens. Scopes come with a variety of reticles (or crosshairs). These are the markings which appear on the image. They are technically disconnected from the actual optics, and so they can be in whatever shape and form the manufacturer wishes. It can take the shape of a cross, a dot, a circle, and many others. It usually comes in black or red, sometimes both. 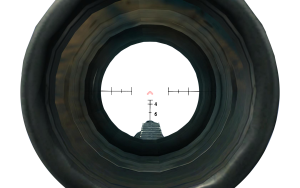 Some scopes let the shooter choose a reticle, while with other scopes the reticle is a fixed feature. Essentially, the reticle is what focuses you on a specific mark within the image. It shows where the projectile will hit, theoretically speaking. Depending on the scope used, the range, and the zoom power, different focal reticles may come into play. Some reticles remain constant, while others are magnified along with the rest of the image when the zoom dial is triggered. 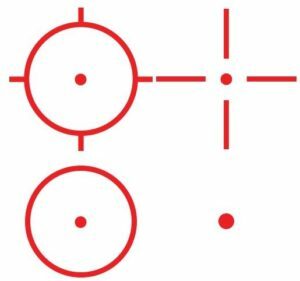 In scopes with a first focal plane (FFP) the reticle itself is placed before the zooming components, so the reticles are magnified along with the rest of the image. In second focal plane (SFP) scopes, the reticles are found after the zooming elements within the scope, so when the zoom is triggered, the reticle which appears on the image is seemingly unaffected, and it remains relatively the same size. Some scopes come with turrets, whose goal is to fix your aim on a small scale. Turrets allow corrections which are precise and configure the image by moving the actual optical elements located within the scope. This is measured in minutes of angle (MOA) increments, which are 60 units within a degree. 1 MOA = 1/60 of a degree. Scope turrets can be adjusted for height (vertically), and for wind interference (horizontally). Most turrets produce an audible click when their dials are moved, and that way the shooter can keep count of the clicks when estimating the range. Once the shooter has reached the desired precision point, the turrets can often be set back to zero, thereby retaining their current position and creating a default setting. In order to protect this sensitive and often expensive equipment, two popular methods are used: bikini style covers and flip-up covers. The bikini style lens guards are caps held joined with elastic bands. 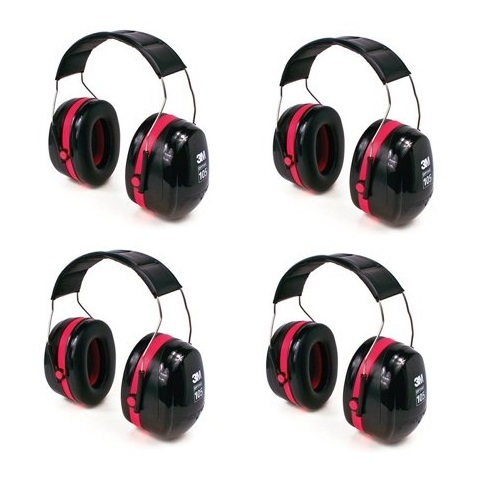 When covering the lenses, these bands produce a tension which keeps the lens covers in place. The flip-up solution is also a good one: the lens covers simply flip upwards to uncover the lens. Unlike the bikini style, there are no easily-lost elastic bands involved, which is why it is mostly considered the better option of the two. Some objective lenses are anti-reflective, and if not being spotted (for instance, during combat) is something which matters to you, it is worth investing in a non-reflective scope. This solution was developed for the military in the 1980’s, and was quickly picked up by the civilian market. These days, it is used by many shooters around the world. M16 optics and scopes are a great advantage in pretty much any situation: hunting, combat, competition, practice. Just remember to always have back-up iron sights, though, because you never know what will happen. Thanks for reading & Be sure to check out our review of the New Glock 19 & 17 Gen 5!